Placekicker, or simply kicker (PK or K), is the player in American and Canadian football who is responsible for the kicking duties of field goals and extra points. In many cases, the placekicker also serves as the team's kickoff specialist or punter as well. Because of the difference in techniques needed, to avoid leg fatigue, and to reduce the risk of injury, on the professional level most teams employ separate players to handle the jobs. The placekicker usually will only punt when the punter is injured, and vice versa. (One player often handles both jobs in the Canadian Football League, which has smaller active rosters than in the NFL.) A professional team will occasionally even have a kickoff specialist who handles only the kickoffs and serves as a backup to the kicker who handles field goals and extra points. This is typically done to further protect a premier point-scoring kicker from injury or if he, while accurate, does not have sufficient distance on kickoffs. Amateur teams (e.g., college or high school) often do not differentiate between placekickers and punters, have different players assume different placekicking duties (for example, one person handles kicking off, another kicks long field goals, and another kicks from shorter distances), or have regular position players handle kicking duties. The last option is quite common on high school teams, when the best athletes are often the best kickers. Before the modern era of pro football, this was also the case for professional teams, particularly when most placekicks were still made in the "straight on" style outlined below. Although kickers are protected from direct physical contact on field goal attempts, this is not generally true on kickoffs, and a kicker can see significant contact during a kick return. Kicker Björn Nittmo notably suffered severe brain damage from a hit he sustained on a kickoff in 1997. Placekickers and punters are often the lowest paid starters on professional teams, although proven placekickers sometimes earn over $1 million per year in salary. It is not uncommon for placekickers to be some of the smallest members of their team. However, The New York Times in 2011 wrote that NFL kickers had adopted year-round weight training and strict diets. Sebastian Janikowski that year was a 6-foot-2-inch (1.88 m) and 250-pound (110 kg) kicker. Kicker Rob Bironas, who was 6 feet (1.8 m) and 205 pounds (93 kg), noted, "I might be bigger than some wide receivers and cornerbacks." The presence of foreign born-and-raised players in the highest levels of gridiron football has largely been limited to placekickers, and more recently to punters from Australia as well. Occasionally, these players come from outside the traditional American high school or college football systems—and all but one of the women to have played men's American football at the college level were placekickers while the lone exception was a placekick holder. Notably Tom Landry recruited several soccer players from Latin America, such as Efren Herrera and Raphael Septien, to compete for the job of placekicker for the Dallas Cowboys. Cypriot Garo Yepremian was renowned as much for his kicking proficiency as he was for his complete lack of awareness of the sport early in his career. These anecdotes increase the perception of the placekicker as an outsider. As of 2017, only four kickers have been elected to the Pro Football Hall of Fame: George Blanda, Lou Groza, Jan Stenerud and Morten Andersen, and among them, Stenerud and Andersen are the only ones who did not also play another position. There is only one special teams player (including punters, return specialists and long snappers) to ever win the NFL's MVP – Mark Moseley in 1982. Nevertheless, due to their duties in kicking both field goals and extra points placekickers are usually responsible for scoring more points than any other player on a team, and very often entire football games may come down to a single kick. The top 25 players in NFL history in career scoring are all placekickers. Justin Tucker is the highest paid kicker in the NFL. In the NFL, placekickers, along with punters and quarterbacks, are among the only players allowed to wear single-digit uniform numbers; kickers can also wear numbers between 10 and 19. In college and high school football, kickers can wear any number and usually wear one of an eligible receiver (1 to 49 or 80 to 99). Because kickers are generally less prominent on team rosters, and low uniform numbers are much more widely used among other positions at those levels, kickers are often given high jersey numbers that go unused by other players (such as numbers in the 40s or 90s). The two players in documented football history to have worn the uniform number 100, Chuck Kinder and Bill Bell, were both placekickers. Placekickers today are predominantly "soccer-style" kickers, approaching the ball from several steps to the left of it [for a right-footed kicker, or vice versa] and several steps behind, striking the ball with the instep of the foot; all current National Football League kickers use this style. This method of kicking was introduced in 1957 by Fred Bednarski and popularized in the 1960s by kickers like Pete Gogolak and his younger brother Charlie, the first placekicker to be drafted in the first round. Previously, most placekickers used a "straight on" style, which required the use of a special shoe that is extremely rigid and has a flattened and slightly upturned toe. In the straight on style, also known as "straight-toe" style, the kicker approaches the ball from directly behind, rather than from the side, and strikes the ball with the toe. The last full-time straight on placekicker in the NFL was Mark Moseley who retired from the Cleveland Browns after the 1986 season; Dirk Borgognone, who set records with the straight toe in high school, tried but failed to make several NFL teams in the early 1990s. Straight on kickers are relatively uncommon in major college football due to the control and power disadvantages, but straight-on kickers are still seen on high school, small-college, semi-pro and amateur teams. Placekickers in the modern game usually wear specialized shoes (soccer boots), but in very rare circumstances some prefer to kick barefoot. Tony Franklin was one such barefoot kicker, who played in Super Bowls for the Philadelphia Eagles and New England Patriots. Another was Rich Karlis, who once shared two kicking records - the record for longest field goal in Super Bowl history, kicking a 47-yard field goal in Super Bowl XXI and also for the most field goals in a game, seven for Minnesota in 1989, tying Jim Bakken's record of the time, a record since broken by Rob Bironas. Englishman Rob Hart kicked barefoot during his 7-year NFL Europe career. John Baker also used the style in the 1990s in the Canadian Football League, as did José Cortéz in the XFL. The last person to kick barefoot in an NFL game was Jeff Wilkins in 2002. A unique shoe was worn by New Orleans Saints kicker Tom Dempsey; Dempsey had a deformed kicking foot that left him with a flat kicking surface at the front of his foot, and he wore a shoe that accommodated it. 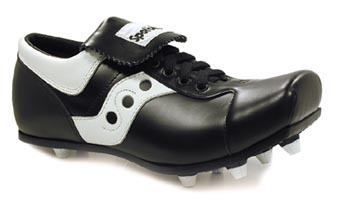 After Dempsey kicked a record-setting 63-yard field goal using the special shoe, the league instituted a rule change establishing standards for kicking shoes. This eventually ended Dempsey's kicking career. Barefoot kickers are banned in the vast majority of high school games, due to a rule by the National Federation of State High School Associations, which requires all players to wear shoes. Massachusetts and Texas play by NCAA rules, and therefore barefoot kickers are legal in those two states. ^ JIM MURRAY (December 15, 1994). "Agajanian Kicked Football Into Age of Specialization - Los Angeles Times". Articles.latimes.com. Retrieved December 3, 2012. ^ Hogrogian, John (2000). "Twelve Interesting Things About The 1939 NFL Season" (PDF). Coffin Corner. Professional Football Researchers Association. 22 (3): 1–5. ^ Graham, Tim (January 27, 2017). "Finding Nittmo: Answers, finally, from the NFL kicker who disappeared". The Buffalo News. ^ a b Battista, Judy (November 6, 2011). "Kickers Are Becoming Can't-Miss Performers". The New York Times. p. SP4. Archived from the original on November 14, 2011. ^ "A Life After Wide Right". cnn.com. ^ "NFL Scoring Leaders". pro-football-reference.com. Retrieved December 17, 2008. ^ Sherrington, Kevin (8 December 2012). "Often overlooked, Texas' Bednarski is the true pioneer of soccer-style kick". The Dallas Morning News. Retrieved 30 December 2014. ^ The Washington Times. "Going sideways into history". The Washington Times. Retrieved 3 January 2015. ^ "Charlie and Pete Gogolak". Football Foundation. 2015. Retrieved 15 January 2019. ^ Klosterman, Chuck (10 June 2016). "A brilliant idea! (For now)". Page 2. ESPN. Retrieved 15 January 2019. ^ "Most Field Goals in a Game". Pro Football Hall of Fame. Retrieved 15 January 2019. ^ Bena, John (10 February 2011). "Denver Broncos Greats... By The Numbers - Rich Karlis". Mile High Report. Retrieved 15 January 2019. ^ "Massachusetts rules" (PDF). miaa.net.